In March, we packed up a few HeavySwing prototypes and made the trek down to spring training in both Florida and Arizona. The goal—introduce the HeavySwing to top professional and college players and coaches to get their honest feedback about the product and the concept of handle-weighting in general. We were very fortunate to secure a few key introductions to pro hitting coaches, and were soon testing the product with coaches, players and even a few Hall of Fame legends (including Rod Carew, Ryne Sandberg and George Brett). Players said that they had never seen or felt anything like it, and we were encouraged by all the positive feedback. We explained the concept behind the HeavySwing and people quickly understood it, but once players and coaches actually swung it, the light bulb really came on. At the professional level, players are all about “feel,” and they said the HeavySwing felt really good and natural in their hands. Some players really liked the product. More than once, we regretfully had to decline offers to buy a prototype on the spot, as we would’ve been left empty-handed with nothing to show teams we hadn’t met yet! In fact, during one spring training game, two pro teams both wanted to use the HeavySwing (we only had one available at the time), so they arrange to have their batboys run it from one on-deck circle to the other between innings. Nearly all of the pro and college hitting coaches who tested the HeavySwing thought the concept lined up with their “hands inside” hitting approach. We realized that we needed to develop a special exercise set that took advantage of the HeavySwing’s unique concept, design and weight distribution. Working with a professional strength and conditioning coach, we were able to develop several warm-up exercises that did just that. We eventually distilled these exercises down to just six that every player should try to include in their on-deck circle routine. 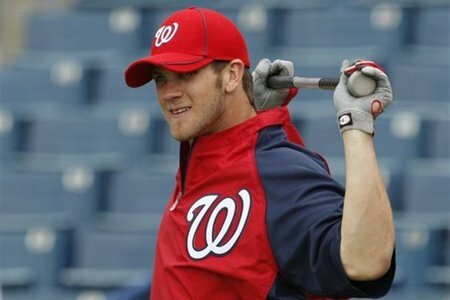 The goal: quickly warm up and activate all the muscle groups involved in hitting before stepping into the batter’s box to minimize the risk of strain or injury, particularly during pre- or early-season and cold-weather games. Very few hitters step into the on-deck circle with an actual warm-up “game plan” or structured set of exercises that they perform before every at-bat. These six exercises, or as we call them, the “Super Six”, were designed to help players make the most of their time in the on-deck circle to make sure they’re as prepared as possible before stepping to the plate. Barrel-weighting in the on-deck circle began with the invention of the donut bat ring in the 1960’s by Elston Howard, catcher and first African-American to play for the New York Yankees.1 Prior to the invention of the donut, players often swung multiple bats before stepping into the batter’s box. Other barrel-weighted training devices later appeared in the on-deck circle, ranging from barrel add-ons such as weighted sleeves to heavy-barreled bats (e.g., Bratt Bat, Schutt Dirx Warm-Up Bat). Even today, some players use crude tools such as heavy pipe and sledgehammers in the batting circle to stretch, loosen up and create the sensation of quickness once they pick up their game bat. 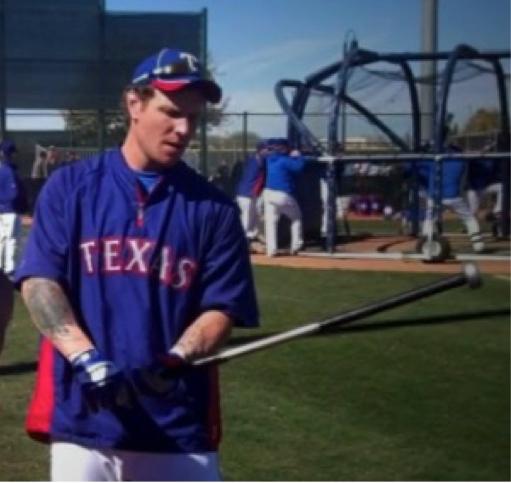 The bat donut (and other end-loaded bats and devices) operates on the principle of post-activation potentiation (PAP). 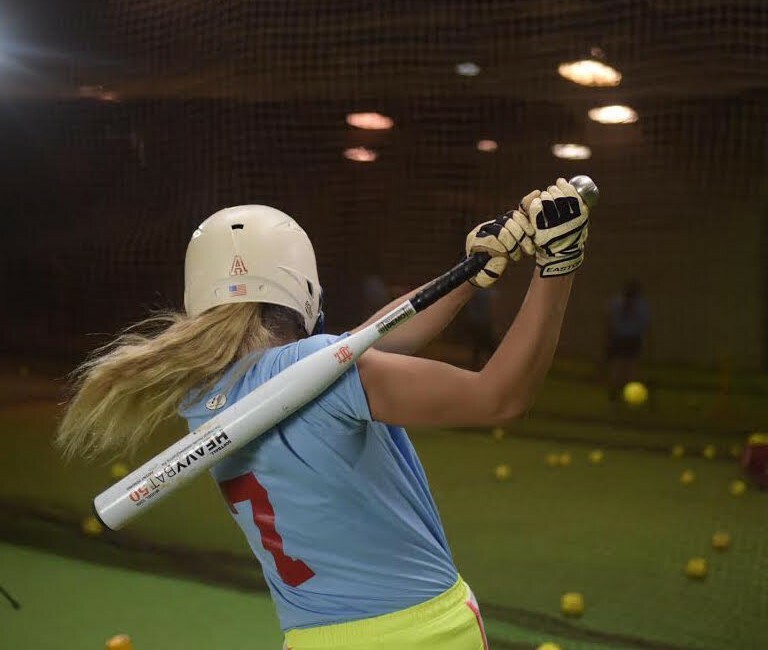 Put simply, immediately after swinging a loaded bat, the player’s game bat feels lighter. With a heavier swing load, the central nervous system experiences greater stimulation, which results in higher overall motor unit recruitment. Essentially, the hitter’s muscle fibers are activated and ready to operate at a higher level of intensity when a lesser stimulus (the game bat) is used. However, the PAP principle doesn’t apply well when it comes to a donut- or barrel-weighted swing in the on-deck circle. The reason is, using a donut or weighted sleeve to increase the bat’s weight significantly changes the hitter’s swing mechanics, essentially doubling the weight of the bat in an uneven distribution. Ultimately, end-loading the bat significantly changes not only the bat’s total mass, but also its feel, weight distribution and moment of inertia (MOI)2. There are some training applications where using a barrel-weighted bat can be beneficial when used properly. However, several studies3 point to barrel weighting actually slowing down the bat when used in the on-deck circle. Dr. Coop DeRenne, a physical education professor at the University of Hawaii and foremost authority on hitting science, has done numerous studies that show donuts used prior to swinging a game bat results in a measurable decrease in bat speed at the plate. Handle-weighting operates on a completely different principle. Placing the weight in the hitter’s hands not only creates a very different swing sensation, or “feel,” it delivers a much different result in terms of training. When a hitter practices using the handle-weighted HeavyBatTM, they gain the resistance and overload training benefits of swinging a heavier bat, without negatively impacting their swing plane or circular hitting path (CHP). In fact, because of the product’s handle-weighted design, it actually promotes and amplifies the “pendulum effect” as described in rotational mechanics theory. While a few commercial products using handle-weighted training technology have been developed in past years, they failed to gain significant popularity and traction in the marketplace. With the launch of HeavySwing Baseball and its original product line in 2011, hitters and coaches found a new way to integrate the concept into their workout routines. Immediately after HeavySwing’sTM introduction in 2011, handle-weighting saw a surge of popularity in the big leagues, appearing in on-deck circles in professional ballparks around the country. This culminated with Series MVP David Freese and other members of the World Champion St. Louis Cardinals using the first handle-weighted on-deck training bat—a HeavySwingTM 3600—in the batting circle in the 2011 World Series®. You can read the rest of the white paper here. 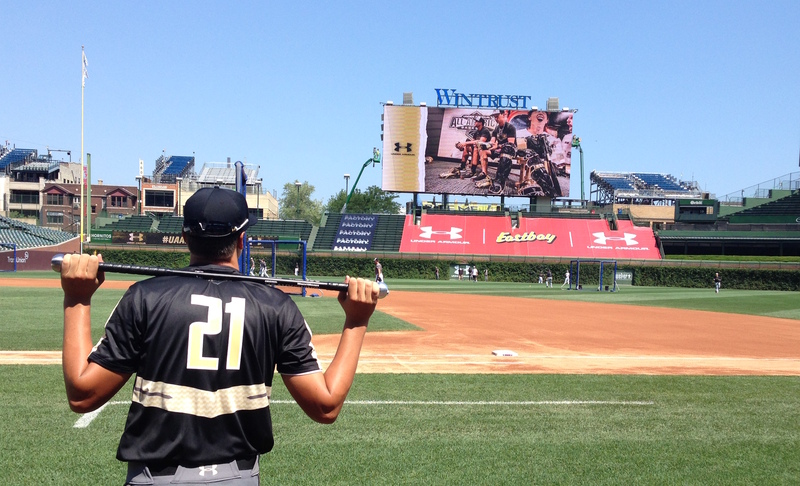 We are honored to have been part of such a prestigious event in Chicago last week – The 2015 Under Armour High School All-America Game Powered by Baseball Factory. 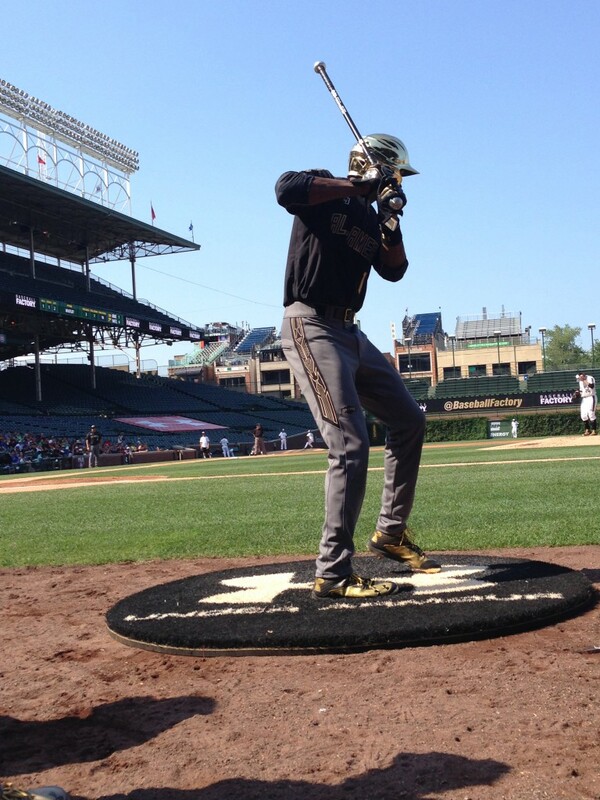 Over the course of three days, the best high school baseball players in the country had the chance to live and play ball like the pros. From TV interviews, autograph signings, clubhouse lounging, a pro scouting showcase and ultimately playing a nine-inning game at historic Wrigley Field, these young men got a sneak peek inside the life of how professional ball players live 162 days out of the year. Thursday, August 13, 2015, 10:00 a.m.
HeavySwing arrives at W Hotel Chicago to take part in the “car wash” player experience. 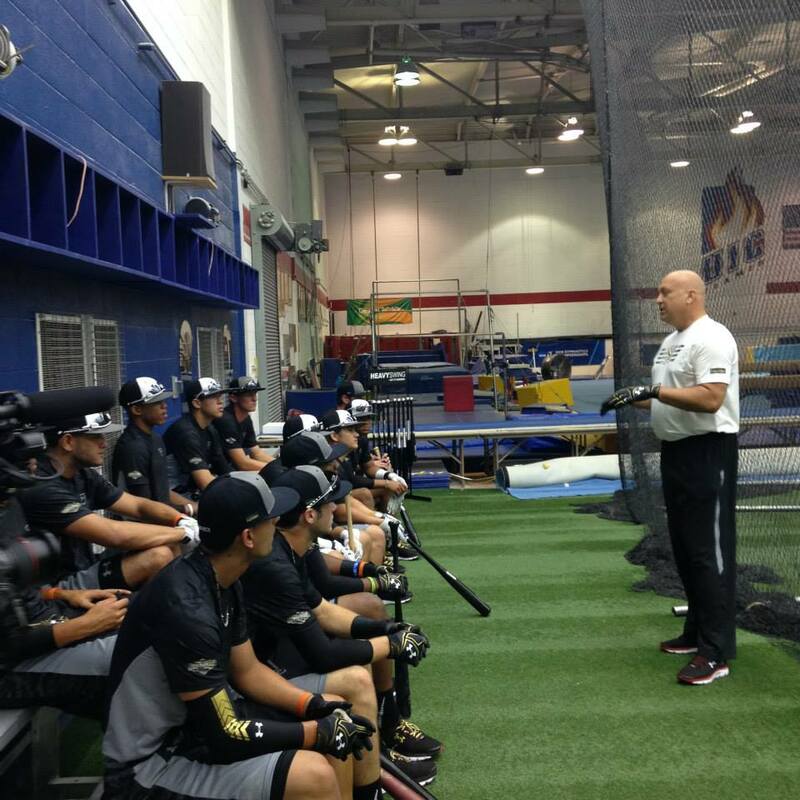 Alongside Baseball Factory, Gatorade and Ripken Baseball, HeavySwing enjoyed the opportunity to individually speak to each of the 40 All-Americans, introducing them to the original handle-weighted training concept and sizing each player for their complimentary HeavySwing. We saw all sorts of player reactions from “I’ve never heard of you guys, but oh, wow,” to “oh yeah, my buddy in the Rays organization uses this all the time.” Players came through one by one, and left excited and anxious to ‘hit it harder’ with HeavySwing over the course of the next three days. 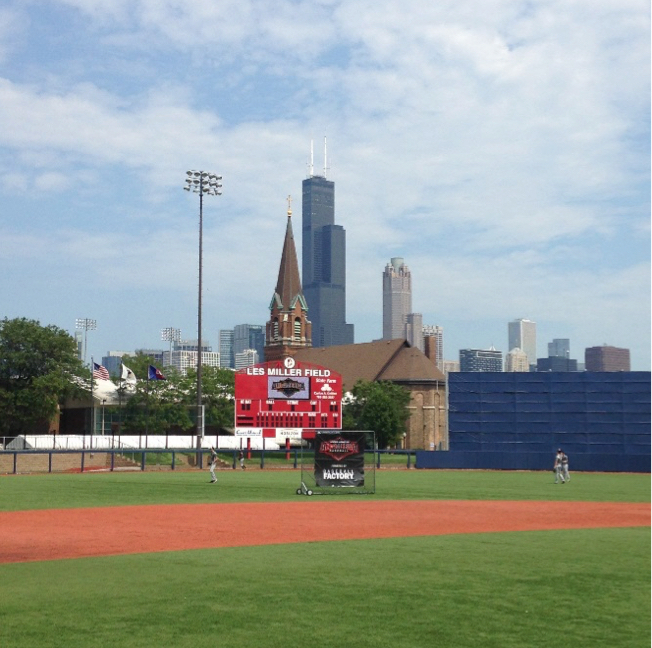 After the “car wash” concluded, it was time to pack up and head to University of Illinois Chicago’s Les Miller Field at Curtis Granderson Stadium, a ballpark with an absolute breathtaking view as the Chicago skyline towered over the center field fence. Here, players would participate in a walk-through training session with former MLB Stars Cal and Bill Ripken. HeavySwing products were available in each of the three batting cages during the training session and in the on-deck circle during the highly anticipated first round of the home run derby. They were well utilized and enjoyed by the All-Americans. The derby didn’t dissapoint, as eight finalists advanced to the championship round on Saturday at Wrigley Field. Will Benson, who swings a HeavySwing 36/100, led the way with 11 bombs, many of which landed well beyond the right center field fence. A successful and very fun first day was in the books. The day before game day. Billy Bean, GM of the Oakland A’s, addressed the 40 All-Americans at breakfast, followed by a highly competitive game of stick ball with local area children as part of a community outreach effort.. 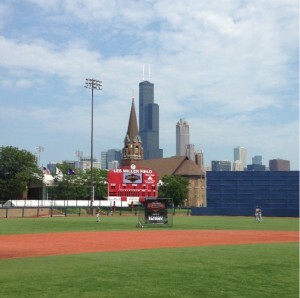 They then proceeded to the UIC campus to showcase their baseball skills in front of pro scouts. HeavySwing was again present and utilized in the cages prior to batting practice. Receiving countless excellent feedback from players and coaches, and embracing the slogan “Hit It Harder,” players transitioned from swinging the HeavyBat during cage work, to the HeavySwing in the on-deck circle, and finally their game bat for live BP in front of the scouts (these kids can rake!). A low-key afternoon would follow for the players as the big game was just 24 short hours away. Game day! HeavySwing arrives at Wrigley field to set up a booth in the concourse of the historic ballpark at 1060 West Addison Street. 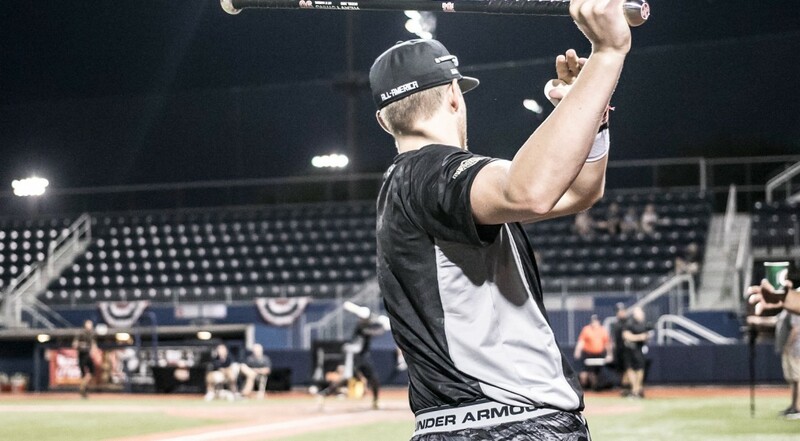 As thousands of fans filtered in for the most anticipated high school baseball game of the year, the HeavySwing booth saw no rest as countless fans, parents and coaches stopped by to see what the handle-weighted training concept was all about. The reactions and interest was priceless. “You really do have to swing it to believe it,” one parent said. We made our way to the home team dugout as the championship round of the homerun derby was about to start. Bo Bichette, who swings the HeavySwing 36/80, jacked 10 home runs to take home the trophy; congrats Bo! As we inched closer to game time, we made sure HeavyBats and HeavySwings were plentiful in the on-deck circles so players could continue utilizing the handle-weighted training concept they had become familiar with over the past two days. There was plenty of offense as the National team beat the American team in an 11-5 thriller. During and after the game, our booth stayed busy, as fans continued to pile in and inquired about the “stick” players were using in the on-deck circle. The feedback was beyond encouraging. As our time in Chicago wound down, there was time to reflect on our eventful trip to such a prestigious and historic baseball city. After gaining tons of exposure, interacting with players, parents, coaches and fans, we achieved our ultimate goal which was introducing young players to the handle-weighted training concept, which caught on and registered to them very quickly. Thank you Under Armour and Baseball Factory for having us and for hosting such a terrific event. We look forward to the 2016 All-America Game and also to seeing HeavySwing on baseball and softball diamonds across the world! Welcome to The Batter’s Box, HeavySwing’s blog! First, a brief introduction and a little bit about who we are. We’re HeavySwing, a diamond sports manufacturing company headquartered in Baltimore, Maryland. We’ve developed a patented lineup of handle-weighted training bats that give baseball and softball players of all ages a safe, mechanically sound way to improve bat speed and exit velocity, build core strength, and increase power. As the pioneer of handle-weighted swing training, our bats are used by top hitters of every age and level of play, from youth to professional players on more than 20 big-league clubs. And judging from the great testimonials we’re fortunate to receive, HeavySwing bats are making a real difference in helping hitters create their perfect swing, with impressive results and on-field stats to prove it. We hope our blog will be a valuable resource for hitters, coaches and parents. We’ll be updating it frequently, so be sure to check back often. We also hope that you’ll join in the conversation with us and the other members of HeavySwing Nation. Thoughts, feedback and comments are welcomed and appreciated. © 2014 HeavySwing. All Rights Reserved.